This sample proposal is based on the same layout as this template and is included in every Proposal Pack. 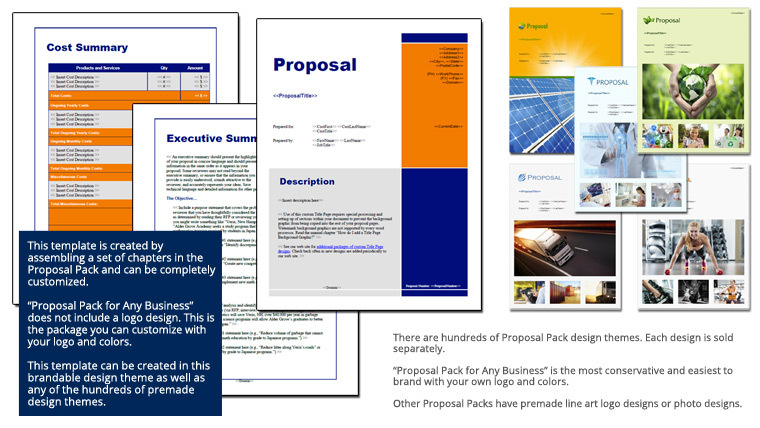 The visual design of the templates will match whichever Proposal Pack design you purchase. You can also create an editable Word version of this sample in any design theme of your choice or branded to your own logo. The Transportation Shipping Services Proposal is an example of a proposal using Proposal Pack to pitch the services of a trucking company to a client to haul their goods. This is a good example to follow for any business or individual offering transportation or logistics services to clients. first big contract using your Proposal Pack. Thank you! I’m the epitome of "small business" (there are just 2 of us) and your proposal pack helped me put together a very professional looking proposal."